Spot bandage measures 0.875 inches in diameter. Bandage is a tan flesh color made from plastic material. Comes in a box of 100. 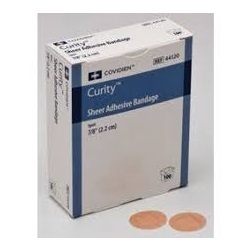 Curity Sheer Bandages are latex-free bandages with a Telfa pad for "ouchless" protection. Made of perforated, vinyl film. The porous, hypoallergenic adhesive allows skin to breathe. Easily conforms to a variety of shapes. Minimizes wound trauma and promotes wound healing. 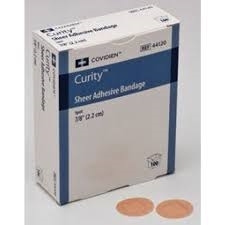 Reduces potential for skin irritation.Thin, plastic material blends with skin to make the bandage less noticeable.